In the near future couples hoping to prove their love for one another, and wanting to increase the emotional bond between each other, can have a simple medical procedure that increases the empathy between partners. Good-looking billionaire Trent Worth has insisted that he and the lovely Briddey Flannigan (hey work for a mobile phone manufacturer and they are currently working on a new model to finally rival the giant Apple) have the procedure to prove to one another how much they care about each other. But something seems to go wrong. Trent and Briddey don’t show any signs of being better able to understand one another’s feelings, but Briddey begins to pick up people’s’ thoughts and the one that comes through loudest and clearest belongs to the IT tech nerd guy at the office. More voices continue to come through, making life difficult for Briddey to concentrate and the only one who can help her through it is C.B. – the tech nerd she could never fall for. Or could she? He’s kind, helpful, and gives her his full attention, unlike the handsome business-running tycoon Trent. Still…just look at them! But C.B., despite a very Jewish sounding last name, happens to be Irish, just like the red-haired Briddey Flannigan, and there’s something in the Irish gene pool that predisposes them to having the ability to read minds. (I KNEW my wife was too good at knowing what I was thinking!) But it’s also possible that the new phone Trent was planning to release would enhance that mind-reading capability. Suddenly Briddey doesn’t think it’s such a good idea. I’ve never read a book by Connie Willis before, though I’ve seen her name around on the bookstore shelves for some time, and this struck me as an interesting premise and worth reading. This is a beach read sort of book. There’s nothing that will make you sit back and reflect on what you’ve read. It doesn’t open any new doors of thought or adventure, but it’s light fun, even if a little ridiculous at times and heavy-handed at others (with lines such as: “He’s gorgeous, he’s willing to commit, and he’s romantic! Do you know how rare that is?” you get a pretty good idea of what you’re going in to). We spend waaaaay too much time learning that C.B. is Irish – practically an entire chapter. Of course we learn later why that’s important, but we don’t know why he’s spent so much time covering up the fact. We also, later, spend too much time in a library – a nice, quiet space for someone who is being bombarded with people’s thoughts, but by the end of the chapter, I didn’t understand why we’d spent as much time, and as much secret time, as we did. All in all, a fun read, and if someone asked for a recommendation of a fantasy romance for reading at the beach, I’d suggest this title. Looking for a good book? 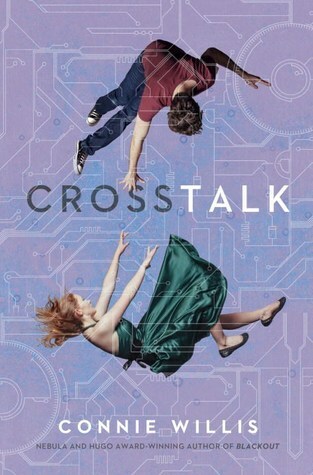 Crosstalk by Connie Willis is a light, entertaining fantasy/romance read that moves along much quicker than the 500 pages might suggest.